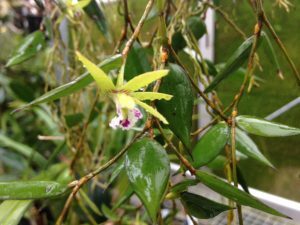 Dendrobium pugioniforme is a remarkable orchid from Australia with thick pointed leaves produces along long pendulous stems. The flowers begin to appear on our plant in early March and the last ones go over at the end of April. We grow our plant mounted on a largish piece of cork bark but the plant has grown far beyond the mount and now hangs down over a metre. We spray the plant daily and (the photo above was just after watering) and hang it up where it gets good light in our Cool Asia section.